When I first started making stained glass hangings as a hobby more than ten years ago, I used commercial patterns because I thought I couldn't draw. I'd freeze working with a pencil and would erase so much that the paper tore. Glass Eye 2000 changed that forever. As soon as I started using it I realized that the mouse and the Undo button would release my creative ideas. Over the course of about eight years I built up a large inventory of original designs on my hard drive. Then just a few months ago it crashed. At the time I was in the midst of developing a proposal for a major four-window public commission. Fortunately the staff at Dragonfly Software helped me get up and running again quickly and I was able to redo my designs by tracing from draft paper copies. Note to readers: make backup copies of all your work! Although I still take stained glass commissions, much of my current work is fusion glass. Many of these pieces I design freehand as I cut the glass, or in the kiln with combing. Yet, there is still a place for Glass Eye 2000 in fusion. For the multi-layer powder picture, Sailor's Delight, I used a pattern to ensure that the placements of the horizon line, boats and sunset were consistent on each layer. I have used Glass Eye 2000 to design fusion windows and doors so that the client can see and approve the designs before I start. 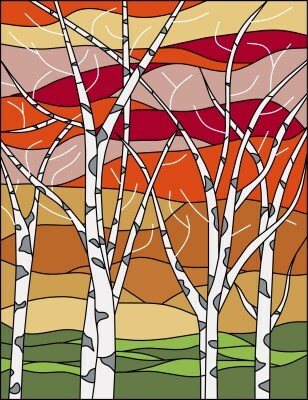 Birches, the Design of the Month for March, is a yet-to-be-completed design for a pair of fusion windows that will be hinged together to close as shutters. I plan to fuse the colors for the background first. Separately I'll fuse transparent grey onto white trunks and branches. As a single layer in the kiln they'll take on a rounded shape. Smaller branches will be created as vitrigraph stringers. Then I'll take fuse the trees onto the background for a 3D effect. Cat Door was designed as a combination fusion/stained glass door. The thinner and dotted lines separate colours fused together while the thicker lines indicated lead seams. The blank square at the bottom was left open for the cat to go through as this door separates a family room and a laundry room where the cat litter is kept. Over the years I've also used Glass Eye 2000 as a CAD program to design the layout of my studio, prepare a lot plan to submit for building approval and to plan layouts for various booths at shows. I'm now more comfortable using a computer program than a pencil, ruler and eraser! 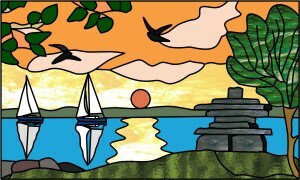 I hope you'll visit my website and look at other work I've created using Glass Eye 2000. Eleanor Brownridge began designing and making stained glass windows as a hobby. Once bitten by the glass bug, she started taking advanced courses, first in stained glass and later in fusion glass. She has studied glass construction, architectural fusion glass and kiln casting under master artists in Toronto and in New York and Washington states. Initially, her customers discovered her through word-of-mouth and studio tours. Then in 2004, various galleries and gift shops across Canada started selling her serving dishes and sculptural pieces. Her windows are in public buildings and private homes throughout Ontario. In 2007, Eleanor relocated to the Pretty River Valley just south of Collingwood to open her TurtleCreek Art Glass studio. There, her style is inspired by the trees and nature in the surrounding Niagara Escarpment, as well as a safari to South Africa.